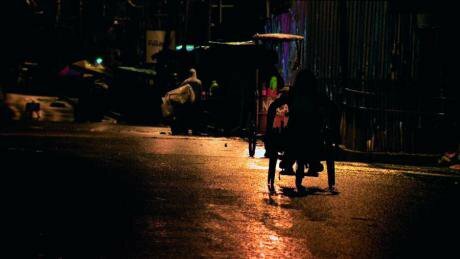 In Freetown, Sierra Leone, the homeless live by night. Many of these men and women are disabled, faced with societal neglect and scorn for the supposed abhorrence of their condition. The streets are dark, dirty, and unfriendly, lit only by dim streetlamps and the lights of intermittent passing vehicles. Boris Gerrets’ Shado’man is a “biotopic exploration” - a close-up of a local environment - looking at the lives of a group of people reduced to begging and sleeping on the streets, highlighting their resolute and dignified response to suffering. Shero, one of the Freetown Streetboys, confesses that he no longer dreams. On the streets it is too hard to sleep; there is no protection from the elements, or from lawbreakers. Perhaps when he has finished construction of his sheet metal hut he will be able to sleep more soundly, to dream. But is it possible to think of something greater in life beyond survival when even that is a struggle? Director Boris Gerrets demonstrates that dignity and humanity can exist even in the most seemingly undignified and inhumane living conditions. The friendships and sense of solidarity between the Streetboys, though born of their upsetting shared experiences of devastating social neglect, are nonetheless a lifeline for each of them. Friendly bantering back and forth, shared stories, and conflict resolution skills are a breath of life projected onto the bleak backdrop of the dark and sleepless streets. Any inhumanity is imposed on them by the rest of society; the rejection and contempt of their parents, being ignored in the streets and having to live by night, being reduced to a life of begging. The film asks us whether the homeless, the disabled, those rejected from society, can truly be seen either as without dignity or as unlike us. Perhaps it is we, who see them as alien and other, who lack humanity. A social experiment by YouTube user NorniTUBE demonstrates this judgmental side of societies against its homeless populations, this time in the streets of Paris. A seemingly homeless man falls down in a busy street, crying out for help. A few people pause to take a second look, but more than five minutes pass before somebody stops to help. Then, a man in a suit falls down in the exact same location, and does not need to call out for help before several people have rushed to his side. What exactly must we conclude: that the suffering of the impoverished is less pressing to us than the suffering of those who appear to be ‘like us’? Perhaps we have accustomed ourselves to ‘their’ suffering. Perhaps we mistrust that ‘they’ truly are suffering. Certainly it is the case that poverty and homelessness are subjects which make us feel particularly uncomfortable, and which we tend not to face head-on. Shado’man is a film that directly challenges our deliberate ignorance of homelessness and poverty. In one scene, we see David, who is blind, helped to cross the road by a passing stranger. One act of kindness, among dozens of people who ignore his need, passing by without a second thought. In Britain too, the poverty gap is widening, and the number of people claiming charitable aid, for example from food banks, has dramatically increased in the last year alone. Yet to many, it seems nothing has changed; it is easy not to notice or pay attention to the suffering around us. Shado’man forces us to wonder what kind of encounter with the other it takes for us not to ignore this. Shado’man had its UK premiere at OCDF on June 18. openDemocracy is an Open City Docs Fest media partner.